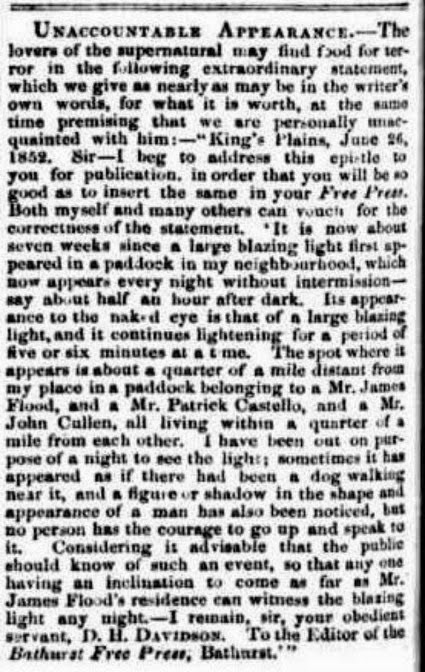 By Jon Wyatt - In 1855 a 'blazing light' haunted a distant paddock at King's Plains, New South Wales; and witnesses claimed figures of “a black man” and “a dog” appeared near the light as well. What was happening at King's Plains in 1855? King's Plains is an historic district on the Mid Western Hwy between Blayney and Bathurst, on the Tablelands NSW. Explorers reached there in 1815 and the early settlers drove out the traditional owners, the Wiradjurai tribe, after guerrilla battles. The NSW government set up a village on the plains to support the early settlers, and when this was later abandoned the residents moved to nearby Blayney—King's Plains Village Road reminds of this time. During the 1850s and 1860s gold miners fossicked in the creeks but they came and went. Today, King's Plains is home to sheep and cattle grazing properties, turning wind farm turbines, and memories. 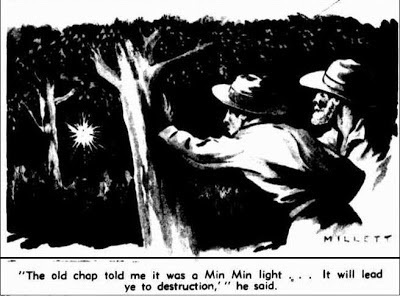 “Having been informed that a large blazing light was constantly appearing at night on a large paddock belonging to Messrs Costello, Flood and Cullen, at King's Plains, I was curious to know if such was the case. On Wednesday night I watched on purpose, and I saw a large blazing light, six or seven times, remaining for about one minute, and appearing again in a different distant spot. To the best of my belief, there appeared in the middle of the said blazing light, the shape and figure of a black man. The distance... was about two thousand yards. The incredible letters could be dismissed as a hoaxes, however the people named in the letters were real and they never rebutted the story. D H Davidson was ex-British Army and a schoolmaster; John Welsh a sheep farmer from Triangle Flat, 20 kms S of King's Plains. The haunted paddock owners were men of some standing: Patrick Costello was a blacksmith; James Flood a hotel keeper; and John Cullen had an interest in politics. During the 1850s a rising new breed of farmer and business person fought against an established pastoral elite for political control, and the names John Cullen, John Welsh and Patrick Costello appear as supporters of progressive candidates who were standing for the NSW parliament. The five men were real—so what, we may ask, was this 'blazing light'? 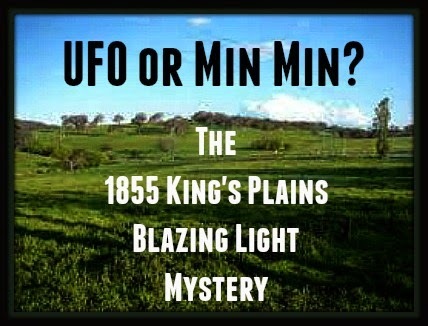 The King's Plains blazing light was probably an extraordinary Min Min and “the blackman ” and “dog” merely optical illusions, however there's a curious footnote. 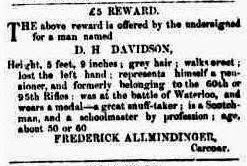 In July 1856 Frederick Allmindinger of Carcoar a nearby town, posted a reward notice for information on the whereabouts of D H Davidson; the schoolmaster had apparently mysteriously disappeared. Did he venture too near to the 'light'-- was he abducted? Was the 'blazing light' a visiting ET craft?